Image: Andrea Nguyen/Flickr//Original photo was cropped but not altered for this article. It’s hard not to love Chick-fil-A. They’ve got delicious sandwiches and hilarious advertisements, and they’re closed on Sundays to let their employees be with their families (and we try to remember to be good people when a craving hits us on the weekend). One disappointment? Last year, Chick-fil-A removed their much-beloved coleslaw from their menu. Luckily, they were kind enough to share the recipe before saying goodbye to it forever. Yes, it’s gone, but that doesn’t mean you can’t make it yourself. The very same coleslaw that passed between the hallowed lips of Truett Cathy himself. On the surface, it doesn’t look all that different from any other coleslaw recipe. But if you’ve ever had Chick-fil-A’s coleslaw before, you know it’s almost magically tasty. Whenever you find yourself craving a fast-food-level (we mean that endearingly!) 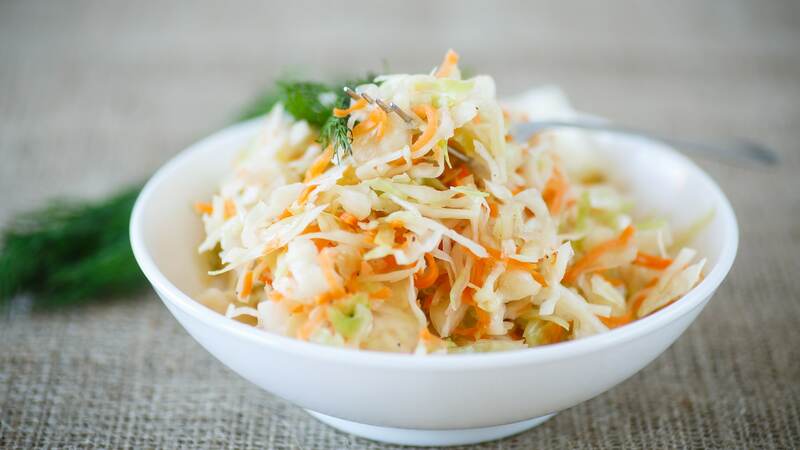 coleslaw recipe, this is the one that’s gonna give you your fix. In a large mixing bowl, whisk together the vinegar, sugar, dry mustard and salt until the sugar is dissolved. Add the mayonnaise and whisk until combined. Add cabbage and carrots and switch to a mixing spoon or spatula and mix to combine. That’s it! Thanks for saving us from missing this recipe forever, Chick-fil-A.